Adelaide’s free Migration Museum — A great place for family historians to visit. The museum reflects the diverse cultures of South Australia, displaying objects that have a story to tell. The early galleries present the history of early migration into South Australia, highlighting the differences with the other colonies, especially no convicts. At the same time the museum puts the movement towards a white Australia into a national context. The white Australia policy became official in 1901 after the formation of the Commonwealth of Australia. Britain was unhappy with the white Australia policy because it was a system that denied equality to people within the Empire. To avoid a blatantly racist policy the Australian government introduced a dictation test, adopted from one in use in Natal, whereby a person could be asked to write down or translate a list of 50 words in any European language. The test was used primarily to keep out Asians, but also many Europeans, because any language could be chosen for the test. Displays pointed out that no one taking the test after 1909 passed, and it remained in use until 1958. Things are very different in Australia now, but it does help to explain the high preponderance of British Isles connections among Australian families. The museum also has displays on the many different ethnic groups that have come to Australia since the ending of its “white policy” rules. I also enjoyed an exhibit covering John McDouall Stuart’s journeys into the Australian outback in the 1850s and 1860s, when he attempted to find a route from coast to coast. The hardships experienced in the central desert from lack of water, food and sometimes hostile aborigines created a number of failures. He did succeed in 1862 and upon returning to Adelaide he was welcomed as a hero. 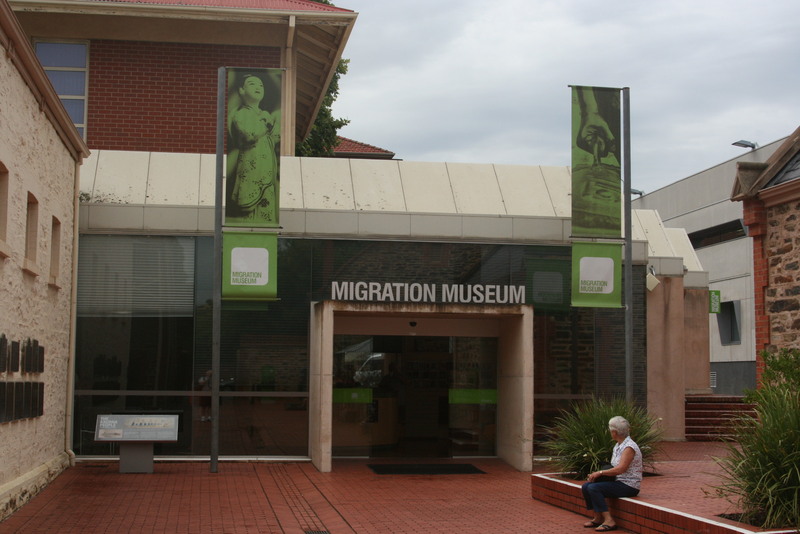 Family historians will enjoy visiting this small Adelaide museum dedicated to migration. Yesterday I gave 4 lectures at the Western Australia State Library in Perth, WA. I had a number of questions about British families that came to Australia after spending time in India. I thought this book would be of interest to readers. Terms and geography need to be defined for best use of this important book. “British Indian” here refers to British citizens and Europeans who worked for the East Indian Company (generally as officers in the army), plus Anglo-Indians of mixed descent from the union of white British or European males and Indian women. Those of mixed descent were often segregated and discriminated against, yet they made an essential contribution to British India and are found in most British India records. Geographically, the area covered by this book, includes modern-day India, Pakistan, Bangladesh and Burma (modern Myanmar). Other areas that may be encountered in India-related records are St. Helena, Iraq, Iran (formerly Persia), Aden, Kuwait, Sri Lanka (formerly Ceylon), Singapore, Malacca, Penang Prince of Wales Island, Java, Sumatra (Bencoolen / Fort Marlborough) and China (Macao and Whampoa). In reality this means most places east of the Cape of Good Hope that had British connections. The book covers the time period of 1600, when the East India Company received its Royal Charter from Queen Elizabeth I, to the present. It begins with a chapter on how to get started, which is actually a must read, especially for North American researchers, because even though the majority of the records needed will be in England, they are not in the places even most English researchers would expect to look. The largest collection of original material is the India Office Records at the British Library, with other collections at The National Archives, National Army Museum, National Maritime Museum, School of Oriental and African Studies, or the Society of Genealogists, all in London, with a few other collections scattered around the British Isles and India. The most important society is FIBIS, Families in British India Society, which provides lots of indexes, resources and an excellent wiki. The following three chapters present the increasing role of the East India Company from 1600 through the Indian Mutiny in 1857, its subsequent loss of control to the British government and the period of the British Raj from 1857 through independence in 1947. The focus is on historical context, but the voluminous record collections applicable to the period and their location are highlighted. The next five chapters focus on five aspects of the Indian life where the British were heavily involved, and which created most of the records of the British Indians. These are: the servicemen and women of the East India Company’s Armies, the Indian Army, the British Army in India and the Royal Indian Air Force; merchants and ships; religion, cemeteries and schools; railways; probate records. Key throughout these chapters is the clear defining of what records and indexes to examine, and where. They identify which resources are available online, which are published and available for purchase, and what will need to be examined in person or onsite. Each of the groups of people and their records is also placed into historical context. A closing chapter addresses Indian independence and life after 1947. 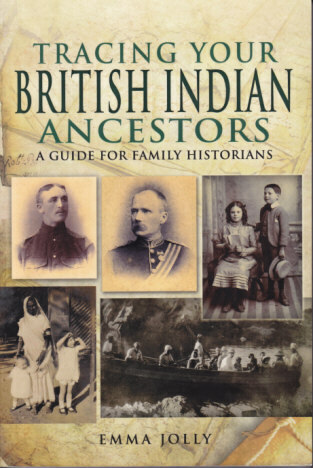 Throughout the book there are a number of short case studies showcasing the biographical information and lives that can be reconstructed from the records of our British Indian ancestors. India developed from a company outpost into the crown in the British Empire with many individuals over the centuries from the British Isles serving in its government, its military or developing its industry. Many have ancestors who moved there temporarily or permanently. This well written research guide is a must for anyone seeking to explore their British Indian connections. I have exciting news for Australian and New Zealand researchers. As I lecture in Australia there is strong interest in Genealogy at a Glance series of laminated help sheets published by Genealogical Publishing Company. I wrote the English Research guide and have a few remaining copies but expect to sell out of them at my next venue in Perth on Saturday. Brian Mitchell wrote the guide for Ireland, and David Dobson wrote the guide for Scotland, all copies sold out. You will need to provide either a check in US currency or credit card information. I apologize to the participants in Brisbane who wanted to purchase additional Genealogy at a Glance laminated folders and I hope you will be happy with this arrangement that I managed to make with the publisher. Yesterday I gave 4 presentations with a Scottish focus to a group of 70-80 genealogists at the Hornsby RSL (Returned Service League) Club in the northern suburbs of Sydney. To get a sense of the audience my opening question was – How many people can identify their Scottish ancestors and put them physically on the ground in Scotland? Everyone put hands up. I knew immediately that I had a different audience than I typically find in the U.S. In the States, when asking a similar question, I will often only get only a handful of participants who can physically locate their ancestors in Scotland. These folks have come to learn how to jump the Atlantic and locate their ancestors. The participants in Hornsby knew where their Scottish ancestors came from, and they were familiar with a wider variety of research tools. Their questions were thoughtful, and they were well prepared to go deeper to break down the brick walls in their research. At the end of the day, they seemed a little overwhelmed but they were clearly ready to immediately use the more complex (and sometimes less known) research tools we discussed. A thoroughly good day for all. As speakers we all get nervous before an event, especially a big one. My nervous energy is high right now. I leave this afternoon for 4 weeks in Australia. In that time period I will give 15 different lectures, doing 38 presentations. See my calendar if you want to know when, where and what topics. I will not be home in between. If I don’t have the document image, or scan with me I will do without it. In the old days when everything was on overhead transparencies and you got on that plane everything was set in concrete. Now with powerpoint we tinker with the presentation, making adjustments, fine tuning the transitions and content right up to the time it is given. The reality is that I know where the strengths and weakness are in my presentations because I am the presenter, and that should be the case. I know what I am having to leave out because of time constraints. From the audience perspective the issue is can I cover the subject in a clear and instructive manner. I know I will do that. So why the stress? Because as speakers we can and always want to do the best job that we can do. Plus we want to be continually improving. Since I start the trip with a genealogy conference on a 10 day cruise I know internet access will be limited. However, I hope to share observations about how things are done a little differently ‘down-under’ during this trip. So I hope you do follow along. Now its time to finish packing the camera, computer and the suitcase. It is always fascinating following the trail laid down by the Blogger network for you never know where it will take you and what gem you will find. This morning I logged on to read John Reid of Anglo-Celtic Connections with a post celebrating the third anniversary of Ruth Blair’s blog – the Passionate Genealogist. I followed the link to Ruth’s blog and scrolled down to read a post from January 18 entitled Ruth’s Recommendations. In Ruth’s list was a link to a free Handy Map of Irish Civil Registration Boundaries available through FindMyPast.ie. What a delightful map it is. Yes, similar maps of civil registration boundaries are available in print, but this is the best that I have seen online and in color. The result is that it got clipped and inserted into my updated lecture on Finding Your Ancestors in Ireland, which is one of the 38 presentations I will give on my upcoming Australia lecture tour (leaving the US this coming Wednesday). Yes, I did leave the FindMyPast.ie logo on the map to give them credit, and to also remind me and my audience where I got the map from in the first place.